Aluminum is used extensively for such things as disposable beverage cans, home appliances, automobiles, and aircraft. 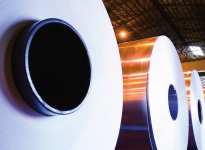 We supply aluminum that has been processed to the required forms and sizes, such as plate, extruded materials, foil, and cast or forged items. Colored aluminum plates for construction, aluminum alloy plates for automobiles, aluminum plates for electrical equipment, aluminum fins for heat exchangers, aluminum alloys for beverage cans, and others. High-precision drawn aluminum tubes for optical equipment, duralumin rods for aircraft parts, free cut aluminum bars for precision equipment, MF tubes for heat exchangers, etc. 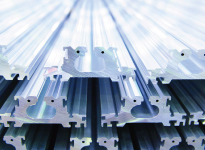 Aluminum profiles for architectural use, extruded aluminum parts for hybrid vehicles, extruded aluminum profiles for ocean-going vessels, high-strength extruded aluminum materials for railway cars, etc. Aluminum foil for lithium-ion batteries, for capacitors, for packaging, for thermal insulation, etc. 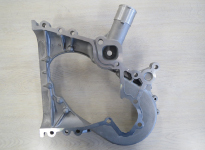 Forged aluminum components for automotive parts, for aircraft parts, for railway cars, etc. We have the right material for your job.We can suggest the right item from a wide range of choices in foils, high-strength duralumin, brazing sheets and so forth. 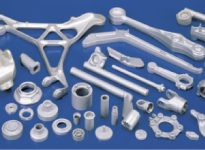 To meet your application, we have everything from high-strength materials to ultra-high precision multi-porous tubing.Our extruded aluminum materials are used in various ways, such as in air conditioning heat exchangers, and for parts in hybrid automobiles. This alloy does not contain lead so it is easier to handle cutting chips in an environmentally responsible manner.Both the 2000 and 6000 series are available in raw form. This is an environmental-friendly material because it can be press-formed without the use of lubricant, due to the urethane, acrylic, or epoxy resin coating. 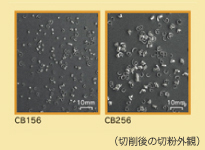 Therefore it doesn’t need to be cleaned.Coating thickness is 1 to 2μ. Unique forged aluminum alloy products can be made specifically for each application using various materials.The 6000 series alloy is very strong, easy to process, and resists corrosion. It is the best choice for automobile parts. 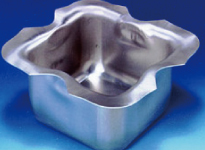 These can be made using various casting methods, including gravity die casting, low pressure die casting, low pressure sand mold die-casting, and lost-wax casting.